Special Containment Procedures: Containment procedure 64-Delta-Romeo (standard containment for anomalous structures, mid-urban) is followed for SCP-2733-01. Two implanted agents are to remain in residence in █████, OK to keep civilians away from SCP-2733-01. Attempts to remove SCP-2733 have been unsuccessful, therefore the room containing SCP-2733 is to be secured by Foundation agents and locked with both keypad and retinal scan. 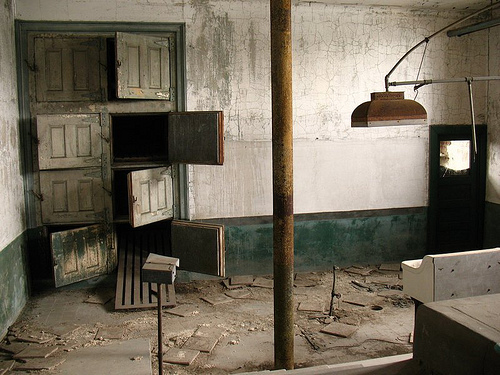 Description: SCP-2733 is a body storage cabinet in an abandoned building (SCP-2733-01) that served as a funeral home/morgue on the outskirts of █████, OK. SCP-2733-01 was abandoned after the business owning it, Restful Meadows Funeral Home and Crematory, went out of business c. 1976. The building has remained uninhabited for the past ██ years. SCP-2733's anomalous properties were discovered after the ghost-hunting show [REDACTED] began to scout the area for a new filming location; an implanted agent discovered SCP-2733 and reported it to Foundation personnel. SCP-2733's primary effect manifests when a human being opens one of the cabinet doors while thinking of another either living or dead sentient creature. Upon opening SCP-2733, the subject will find the head of the creature they were thinking of. Creatures are alive and able to communicate until either the cabinet they are in is closed or another cabinet is opened and a second head is summoned, at which point the initial head vanishes. Attempts to track these heads have been futile. D-8452 Instructed to think of a dog The head of a Jack Russell terrier manifests. Dog is panting and appears in good spirits. Cabinet closed without incident. D-8452 Instructed to think of a human The head of D-8452's uncle, █████ ██████████, manifests. Head is communicative and healthy. Cabinet closed without incident. D-8452 Instructed to think of a famous person The head of English playwright William Shakespeare manifests. Head appears as historians have speculated he would have looked at his death at age 52. Head is communicative and healthy, if distraught. Cabinet closed without incident. Dr. Theodora Wu "My Mom" Unsanctioned test by Dr. Wu. The head of her mother, Min Wu, manifests. Head is intact and, after momentary confusion, is friendly and pleasant. She and Dr. Wu have a brief conversation in Cantonese. D-8452 Instructed to think of a deceased dog The head of a Collie manifests. Dog is identified as D-8452's childhood pet. Dog is barking and appears in good spirits. D-8452 instructed to remove head from shelf. As soon as the head is no longer touching the shelf, its neck expels approx. .5L of blood and the head begins to decompose at a normal rate. Dr. Peter Anselman Instructed to think of D-8452 D-8452 is sedated and placed beside SCP-2733. Upon opening SCP-2733, D-8452's head disappears from its neck and manifests within SCP-2733. D-8452's body expels approx. 2L of blood and collapses. D-8452's head appears sedated as before, but alive. Closing SCP-2733 does not result in D-8452's head remanifesting on its neck. Dr. Wu becomes distressed and is sedated. Further investigation has indicated that Restful Meadows Funeral Home and Crematory was purchased by [REDACTED]1 with intent to demolish. Attempts to locate Joseph Wright (the previous owner of SCP-2733-01) and the body of █████ ██████████ have been unsuccessful. 1. The nation's largest owner of funeral service locations and cemeteries.